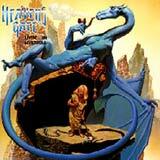 Heavens Gate is one of the most overlooked bands when it comes to power metal. Perhaps that it due to timing, but certainly not due to a lack of talent or quality material. The band came along just a few years too early to ride the power metal explosion of the mid to late 1990's. Along with the German power metal outfit Scanner, who released four very cool albums in the late 80's and early 90's in obscurity, Heavens Gate would also play out their career in relative obscurity. This is a shame, because Livin' In Hysteria in particular smokes so many of the "cookie cutter" power metal releases of today. This five piece band includes a very familiar name from today's metal scene. Sascha Paeth handles guitars for the band, and his serves as a co-producer. As you may know, Paeth has handled production duties for Angra, Gamma Ray, and Rhapsody amongst other bands over the last decade or so since the release of this album. As you can tell by the humorous cover art, the songs are fun and uplifting in nature, very "Helloween-ish" if you will. Having said that, Livin' In Hysteria is in no way, shape, or form a "Keepers" clone, although their mood is very similar. Vocalist Thomas Rettke really gives this band its unique flavor. Rettke has a very distinct voice, one that I wish were still in the business today (if he is, I am not aware of it). He does not venture too high (which has become a trademark for the majority of power metal vocalists today), yet his delivery is very melodic and enthusiastic.Catchy riffs dominate most of the songs, and they easily jump into your mind after the first listen. The band is generous with their guitar solos, yet they do not seek to steel the spotlight with them. The big, sing along harmonized chorus lines enhance the catchiness of the disc as a whole, and add a nice anthemic quality to the songs. The rhythm section is very tight and efficient, aided by the top notch production of Charlie Bauerfield, Sascha Paeth, and Thomas Rettke. There are no keyboards or symphonic arrangements added to the songs. This is pure, guitar driven power metal, yet it still remains entertaining from start to finish. While I still follow the power metal genre closely today, I can certainly understand why many people complain that the scene is stale and overcrowded. Yes, there are too many indifferent releases out there from countless bands trying to make it big. However, there are still enough quality bands releasing interesting albums to keep me happy. If you are a fan that has grown tired of the power metal scene today, I suggest you take a trip into the past for a gem of a power metal album that refuses to become stale or boring, even after twelve years.